Panasonic has announced the arrival of the DMC-G10, a camera that uses the company's Micro Four Thirds technology. 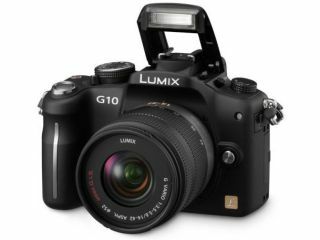 The G10 is touted as the first Lumix G Micro System camera that has a touchscreen interface and brings with it 1280 x 720 HD movie recording. The G10 uses a 12.1MP CMOS sensor and images are processed with the Venus Engine HD II image processing engine. When it comes to viewing your images, there's a 3.0-inch large 460,000-dot high-resolution LCD which is said to offer up 100 per cent of the field of view and it also has touchscreen capabilities. The Live View on show shoots at 60fps, so it should be smooth and ISO levels are said to be 'high'. To stop dust from entering the sensor, there's a Dust Reduction System on board and for those with 'shaky hand syndrome', an Optical Image Stabiliser is inside too. The G10 not only shoots HD video but if you want to use intelligent auto while creating your movies, you can now do so. If only Panasonic didn't decide to record on the high-definition Motion JPEG, we would be much happier. Panasonic has a winner on its hands with the Micro Four Thirds system. The G1 and GF1 are great cameras – if a tad expensive – and the G10 looks to likely to follow this trend. The Panasonic DMC-G10 has a UK release date of June, with pricing still to be announced.